BBC Two - Trust Me, I'm a Doctor, Series 4, Episode 1 - Can I get stronger without going to the gym? The idea of pumping iron at the gym can be intimidating, especially as we get older. But as we get older we tend to lose muscle, so doing resistance exercise to maintain it becomes even more important. So, is there a way to maintain our muscle without going to the gym? How to get stronger muscles in just a few weeks without going to the gym! 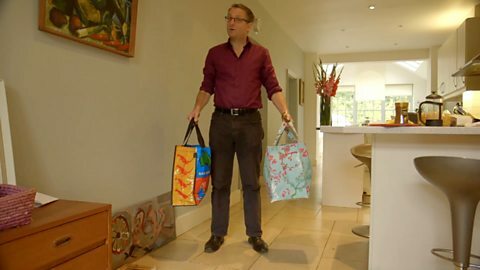 Michael Mosley demonstrates the simple home exercises proven to strengthen your muscles. As we enter our 40s our bodies get worse at building and maintaining muscle, and we can lose as much as 1% of our muscle mass every single year. That continual loss doesn’t just affect our strength: low muscle mass is also a predictor of poor health in old age and even early death. But the right exercises can slow or even reverse this decline. So we designed an experiment in conjunction with Dr Philip Atherton of the University of Nottingham to see if muscle size and strength can be increased without going to the gym. We took 12 volunteers aged over 40 and gave them a month-long exercise programme that could be carried out entirely at home. At the beginning and end of the experiment we tested the participants’ leg strength and power, handgrip strength, and we also used an ultrasound to measure the size of their thigh muscles. The difference between ‘strength’ and ‘power’ is that strength only measures how much force can be exerted, whereas power also includes how quickly it can be applied. Thigh muscle cross-sectional area was 57.5cm³ before and 59.0cm³ after (an increase of 3%). Leg power was 277.1 watts before and 320.3 after (an increase of 13%). Handgrip strength was 35.5kg before and 36.5kg after (an increase of 4%). All of these increases were significant – and a surprise to everyone involved with the study! These simple exercises that anyone can do at home can produce really significant increases in muscle strength. If this is done over a long period of time, it may help to slow or reverse muscle loss caused by aging. The NHS recommends doing at least a couple of sessions of resistance exercise each week to build and maintain strength. Our results show that this can be done for free in the privacy of your own home. Participants were asked to do 3 sets of 12 repetitions every day for 4 weeks. alternatively replace the toothbrush with a heavier object e.g. a bag of porridge or pet food. alternatively do this exercise whilst carrying a shopping bag in each hand. finally add a weight in your hands to increase the difficulty of this exercise. alternatively increase the weight in your hands to increase the difficulty of this exercise. this exercise can also be done with a weight in the top hand instead of a towel to offer resistance. finally, this exercise can be done one-hand at a time as an advanced progression but only if you are confident doing this. finally, if you take the object further away from your body this will progress the exercise. alternatively use a heavier object to perform the exercise- 2 objects can be used (1 in each hand) but these will need to be evenly weighted.